Hi guys! Only one week (or less, if she arrives early on her own prior to our breech scheduled C section) until we meet our baby girl! Everyone keeps asking us: “Are you ready?” and we have no idea how to answer. I mean, logistically, yes, we are ready – we have the room mostly set up, we have a bassinet, we took a bunch of pre-baby classes, the car seat has been installed and checked, we have clothes and diapers, etc. Emotionally, though… I guess? I mean, how can you really be ready for something that you can’t even comprehend? I’m definitely excited, but it still feels very abstract, and I’m having a bit of a hard time with these last couple weeks because they just feel soooo slow – and lonely, since I’m home by myself a lot despite trying to plan social outings at least once a day. I guess I’m just tired of waiting, which I’m sure is very normal! Speaking of – I loved this article on the “in-between” that is the last days of pregnancy. It’s a weird time… your old pre-baby life is still intact, but you have one foot impatiently out the door. The article articulates it beautifully. And so, we wait! 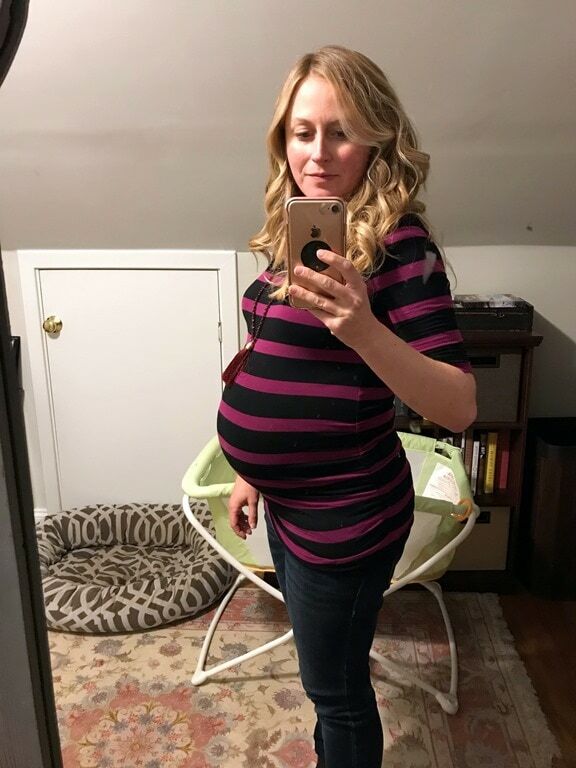 39 weeks yesterday – here’s an awkward and messy mirror bump selfie for your viewing pleasure. Everything looked good at my 39 week check up yesterday… baby is still cozy and breech so it’s pretty unlikely she will move at this point! After the doctor’s appointment yesterday I was running some errands and was surprised to find I was craving veggies. Shocking! I decided to act on it immediately… my food choices haven’t exactly been veggie-packed lately. 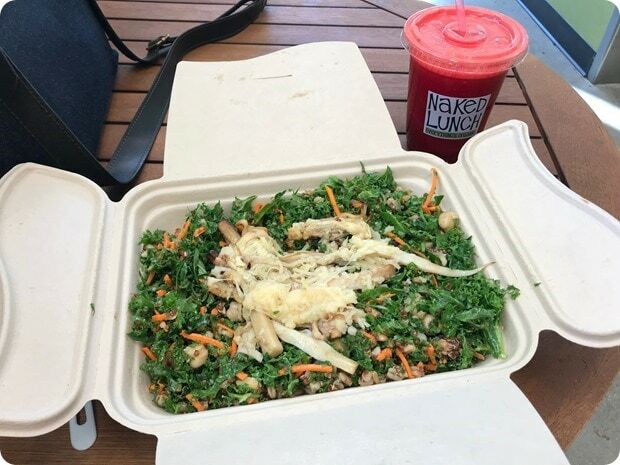 :) This kale caesar salad (that’s hearts of palm with melted parmesan cheese on top – yum) and made-to-order juice (beet + celery + lemon + ginger + carrot) hit the spot! AND I have a very important tip for you – Matt has discovered THE best way to reheat leftover pizza. Put a large pan (dry – no oil or spray) over medium high heat, and place the pizza in it. Once the pan is hot, put a teaspoon or two of water in a corner of the pan (not touching the pizza) and then put the lid on. In about 5 minutes, the hot pan will crisp up the pizza crust, and the steam from the water will help melt the cheese. 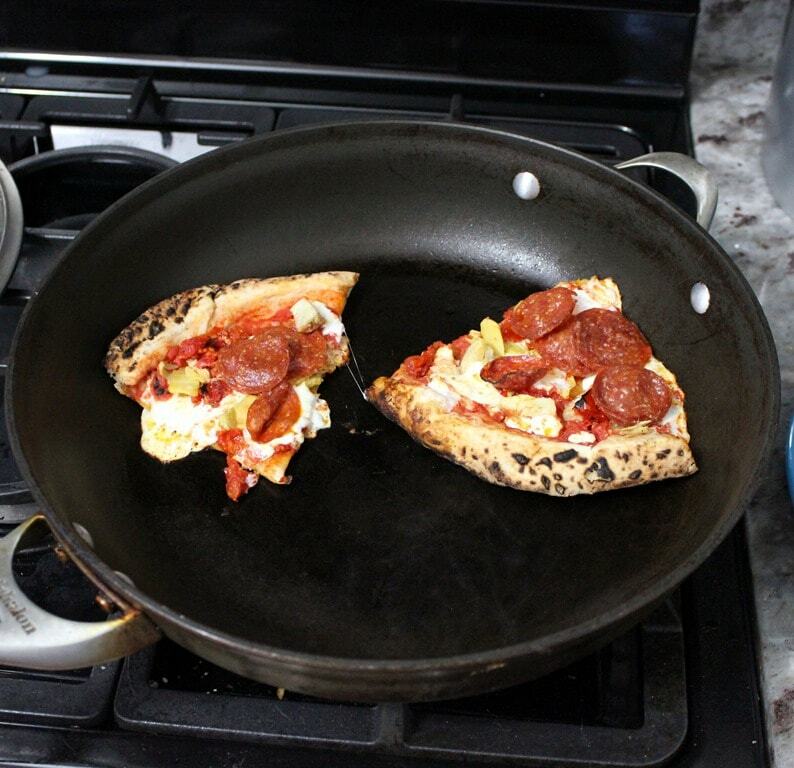 It’s perfection – no more soggy leftover pizza. You’re welcome. No studio workouts to report this week since my exercise has been all walking! I’m thinking of hitting the pool later today, though – we’ll see. And maybe another prenatal yoga class this weekend! One of my best friends sent me this TED talk on parenting taboos – loved it. I need to keep all of this in mind, especially the high highs and low lows portion (vs. more steady average happiness pre-kids), in the coming months! Better nutrition = faster racing. Runner readers – you’ll find this blog post interesting! Absolutely LOVED this BuzzFeed article on 13 Weight Loss Myths You Should Stop Believing Yesterday. Hear, hear! I’m honored to be quoted. When it comes to making the perfect Thanksgiving turkey, it’s all about the brine. Here’s a good recipe for turkey brine if you need one! Next article: Last Baby-Free Weekend! AHH!! So exciting!! I wish I could give you some words of wisdom, but I haven’t been there yet. I’m so happy for you!! 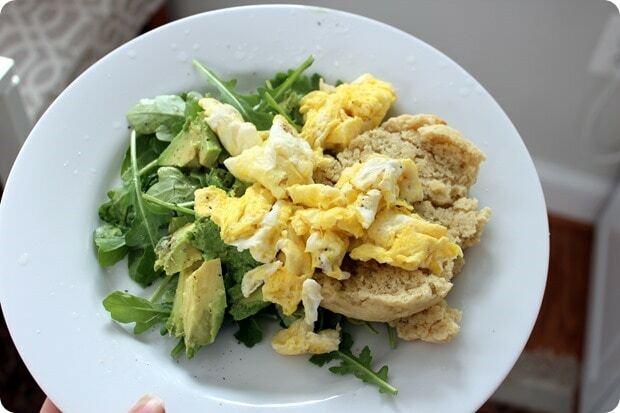 Also, killing it on the eats lately– biscuits, pizza– yum! I am so excited for you! I can understand how difficult this time of waiting must me. I have reheated pizza that way, and it is fabulous! Love all of the food, and I hope you have a fabulous weekend! My friend’s due date was on Monday so I sent her the article you referenced. I think those final days of waiting would be excruciating! I hope you have a great last week before the baby arrives! It’s hard to really ‘enjoy’ this time, though, because you aren’t comfortable and are so ready to meet your little one! I’m glad you know you’ll get to meet her a week from today!!!! We feel the same way. One week to go and one day until our due date too! Best wishes for you and your little one. I think that picture of you and Baby Bump is just beautiful! That’s a great pizza tip! I usually throw mine in the oven on 350 for just a few minutes. I find it also helps keep pizza texture intact. Enjoy your last prebaby weekend! I was so impatient waiting at the end. Be kind to yourself in those post c section days with a new little person relying on you! It’s so hard to get up from a lying position, have Matt bring you the baby when he can. And breastfeeding will get better! Just give it time and reach out to your hospital’s lactation consultants! Can’t wait to read about baby girl! How exciting! Those last couple waiting weeks are so weird, and I don’t know if you can really be 100% ready for such a big life change, but it will be amazing! Try to be extra patient and kind with/to yourself in those early days and weeks. Hope you have a wonderful last pre-baby weekend. One last pre-baby weekend – crazy!! Thanks Emily! I felt the exact same way in the few weeks leading up to my son’s birth. It kind of drove me nuts, the anticipation but not really knowing what exactly to expect. I think its totally normal! Just try to keep your mind busy with other things and enjoy plenty of rest. Thinking of you! Get ready to fall in love! As a grandmother, watching my daughter being a mom has truly been one of the most rewarding parts of my life. Advice: Not a lot of company. Just enjoy! Congratulations. You’ll do great! Thank you Carolyn! I can only imagine how special that would be to watch your own daughter become a mom! Totally not possible to be really truly ready! But good thing you are as ready as you can be. I had a C section scheduled -29 yrs ago & went into labor early. everyone who work labor & delivery- the doctors, nurses & staff are wonderful! I’ve had 4 babies – all in different hospitals w different conditions. I can’t say enough about the wonderful hospital staff in each hospital. They are truly devoted to work that specialty. We have 4 great grown kids now & I enjoy your blog & recipes so much. Thanks for the inspiration & wishing you so much happiness in the future! That’s great to hear! Thank you Diana! I’ve been reheating pizza like that for years and YES it’s the best method ever! Enjoy these last few days before the baby. What I learned after I had each of my babies is that these last days are special. See, right now, the baby is yours. Like your own little secret in a way. Only YOU know every move and kick and bump she makes. Sure others can feel her kicks with their hand. But only you know what she feels like when she wiggles. And right now, you don’t have to share her with anyone. She’s all yours. Her whole world is the sound of your voice and the sound of your heartbeat. In a few days you have to share her with the world. At times you will WANT to share her with the world. But you will miss these final days when your world was quiet and simple and you were the only person who truly *knew* her! So when you feel lonely, just remember this! So excited for you! I was due the 23rd too last year, he came the 27th, but the advice i would give looking back in this window is REST be as refreshed as you can. So whatever that looks like for you. And once the baby is born let your husband watch her and either take a nap or a nice relaxing bath! Self care makes becoming a mom manageable, i didn’t realize this til month 3 so start early! Thank you Melissa! Definitely going to make self care a priority however I can… I agree it’s so important! Your pizza reheating tip (or Matt’s, rather) reminds me of how my husband makes toast. We have a toaster oven, but he prefers his toast made in a pan over the stove. Honestly, it does taste better that way. It’s worth a try if you’ve never done it. Interesting, I’ll have to try that too! And thank you! You’re going to have a baby! Thanks for being so candid and honest in your thoughts on the blog! Been reading your blog from the beginning. Fear not, my daughter, also an Army brat, had her first baby girl, frank breech by caesarean, at 37, and the soon to be 5 year old was lively, healthy and her legs were just fine. My healthy eating daughter felt pretty well after it all, just be slow and gentle with yourself. So well in fact, that she had a VBAC 3 years later with a new baby at 40! Best wishes, my dear on the beginning of this great adventure and tell your mother this will be magical! Blessings and prayers for you all. So excited for you! It seems you’re doing your best to enjoy these last pre-baby days. I was an emotional wreck the last ten days or so as I relentlessly attempted all the on ECV methods of turning my breech baby. It turned out he knew best – the cord was wrapped around his neck so he stayed put! He’s now a thriving 9 month old :) Enjoy the love fest! You got this!! You are gonna absolutely love being a mom. Sending best wishes and positive vibes to you.